Thomas O. Moore established it in 1872 when he came west for his health. He decided to open a store, bought a small tract of land, and returned to Galveston to move his family. He found them all ill and realized there would be a delay in moving. Moore formed a partnership with his friend Alexander Watson Proctor, after whom the town was named, and sent him ahead to start the mercantile building. Moore purchased a stock of merchandise, sent it to Waco by rail, and freighted it by wagon to the place soon known locally as Mooresville. The family occupied three rooms built for them on the back of the store. A building erected in 1876 near Moore's store was used as a community center and school. It was probably the source of the often published claim that A. W. Proctor donated land for a school campus. Deed records do not show a property for a school. A post office was established in 1874 but discontinued in 1881. The community was moved in the early 1890s, when the route of the Fort Worth and Rio Grande Railroad missed the old town by a mile. The old Proctor subsequently disappeared when Alex Chisholm bought the site to use as ranchland. The point where the railroad stopped was at first called Camden and later renamed Proctor. A new townsite with some thirty-eight blocks was surveyed there, and the sale of lots began in 1891, one year after the Proctor post office reopened. Proctor became a shipping center and was even at one time considered for the county seat. By 1915 the town had its own bank, a population of 300, two drugstores, three mercantile stores, two gins, four grocery stores, two barbershops, a lumberyard, a livery stable, a hotel, two blacksmith shops, three doctor's offices, three lodges, and a newspaper. Although it was consolidated with the Comanche schools after World War II, the Proctor school once served over 400 students and occupied an imposing two-story building. Proctor began to decline around 1930, after U.S. 377 was paved and the route passed north of town. After the boll weevil wiped out cotton as an important crop around Proctor, peanut cultivation and dairying became important in agriculture. Proctor Reservoir, a federal flood-control lake, was impounded by a dam finished in 1963 on the Leon River. It provides water for nearby towns and for irrigation and serves as a recreation area. Stores for sportsmen, campers, and travelers have sprung up nearby. The Methodist and Baptist churches continued to function in the 1980s. The community reunion and meeting of the strong cemetery association were still held in June. From the mid-1970s through 1990 the population was 220. A historical marker at the site of the old town well on U.S. highway 377 honors Mary Evelyn Moore Davis, a Texas author and sister of Proctor's first postmaster, T. O. Moore; she often enjoyed visiting the family at Proctor. 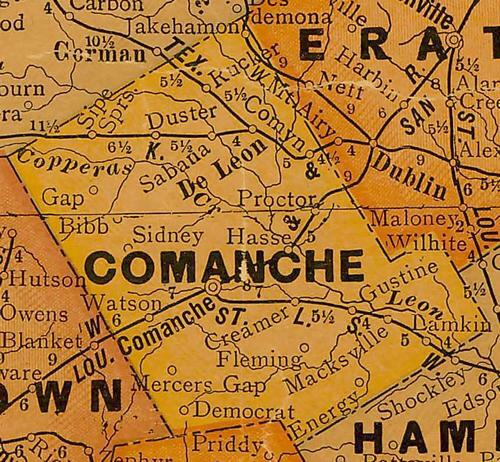 BIBLIOGRAPHY: Comanche County Bicentennial Committee, Patchwork of Memories: Historical Sketches of Comanche County, Texas (Brownwood, Texas: Banner Printing, 1976). Kathleen E. and Clifton R. St. Clair, eds., Little Towns of Texas (Jacksonville, Texas: Jayroe Graphic Arts, 1982).